Bad guys are constantly coming out with new versions of ransomware strains to evade detection. Is your network effective in blocking ransomware when employees fall for social engineering attacks? KnowBe4’s Ransomware Simulator "RanSim" gives you a quick look at the effectiveness of your existing network protection. RanSim will simulate 13 ransomware infection scenarios and 1 cryptomining infection scenario to show you if a workstation is vulnerable. This will take you 5 minutes and may give you some insights you never expected! NOTE: RanSim was created for Windows-based workstations running Windows 7+. RanSim does not alter any existing files on disk. As part of the simulation RanSim does enumerate all files on the local disk(s). For the purposes of encryption, simulated data files are downloaded from the Internet. 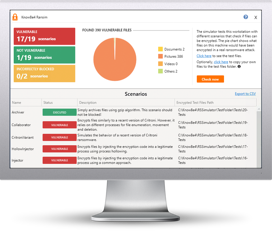 KnowBe4 is the world's largest integrated platform for security awareness training combined with simulated phishing attacks. We help tens of thousands of organizations to manage the ongoing problem of social engineering. Our mission: Train your employees to make smarter security decisions.